Home > Travel > Camper Van Honeymoon – As Crazy As It Sounds? Camper Van Honeymoon – As Crazy As It Sounds? You’ve nailed down every last detail of your perfect wedding day and it’s time to start planning a once-in-a-lifetime honeymoon. The question is; where to start? Should you opt for a luxury all-inclusive retreat on an exotic sunkissed beach? Perhaps you like the idea of a tranquil getaway amid the natural beauty of mountains and lakes to unwind from the relentless build-up to your wedding? How about spending your honeymoon exploring a vibrant and romantic city where exiting new experiences await around every corner? Wouldn’t it be great if there was a way of combining all of these different experiences –and more – into a single unique and unforgettable honeymoon, tailor made to include everything that you and your partner enjoy in a holiday? Well, there is: a camper van honeymoon. It might sound crazy, but stop to consider the benefits of a camper van honeymoon for a moment and you’ll begin to understand why an increasing number of newlywed couples are opting for this novel and memorable start to married life. A camper van is your own mobile honeymoon hotel suite; a great place to enjoy those first days of married life together following your own timetable and in your own space. 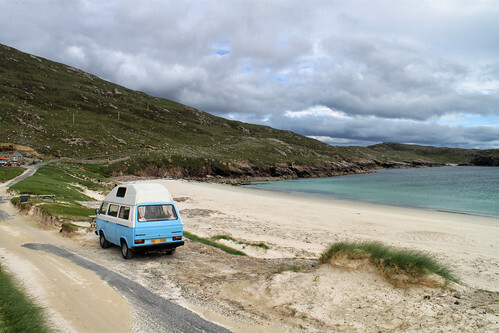 Choosing to honeymoon in a camper van gives you the freedom to explore a destination in your own time, and allows for as much or as little variation as you’d like; a couple of days relaxing at the beach, a few more exploring the countryside, some time to discover local tourist attractions, back to the beach… a campervan allows you to come and go as you please, set your own mealtimes and build your own personal honeymoon adventure as you go. Unlike their predecessors of yesteryear, today’s camper vans and motorhomes can be luxurious in their own right. Larger models feature ample storage for luggage, comfortable living space and all modern conveniences, although many couples opt for the unique experience of honeymooning in a lovingly restored but compact vintage camper van. The beauty of a campervan honeymoon is that it doesn’t stop you from splashing out for the odd night or two in a luxury hotel if and when you feel like it. Camper van hire is available pretty much anywhere, so your choice of an exotic or memorable honeymoon destination isn’t limited. For a honeymoon close to home you can hire a campervan virtually anywhere in Europe, so whether you fancy exploring the vineyards of France or the beaches of Spain, Italy’s romantic cities, Norway’s fjords or the spectacular glaciers of Iceland, it’s all possible. If your honeymoon ambitions lie further afield then why not make a pilgrimage to America’s iconic Route 66, head for Canada’s Rocky Mountains and glorious wide open spaces, or visit Mexico’s majestic Mayan ruins and magnificent beaches. For a truly awe inspiring campervan honeymoon, few places beat New Zealand but if you’ve a little more time to spare a campervan places vast expanses of beautiful Australia at your disposal. In fact, on a camper van honeymoon anything from an African safari adventure to sunning yourself on the beaches of Rio is possible. For anyone who wants their honeymoon photos to depict more than a hotel, a beach and a few local tourist attractions, a camper van honeymoon is the perfect solution. Both a holiday and an exciting and out-of-the-ordinary experience rolled into one, a campervan honeymoon can take you to places that you might never see on a ‘regular’ honeymoon and give you a lifetime of happy memories and dinner party stories. In fact, isn’t it crazier to waste your honeymoon lazing by the pool or queuing in a hotel restaurant when you can hit the open road on the honeymoon adventure of a lifetime in a camper van? Amy is a travel writer from National car and van rental in the UK. Follow her and read more of her articles on Google+ here.